Georgette and her friends [She is on her 28th show, 7 so far on this tour ]….. 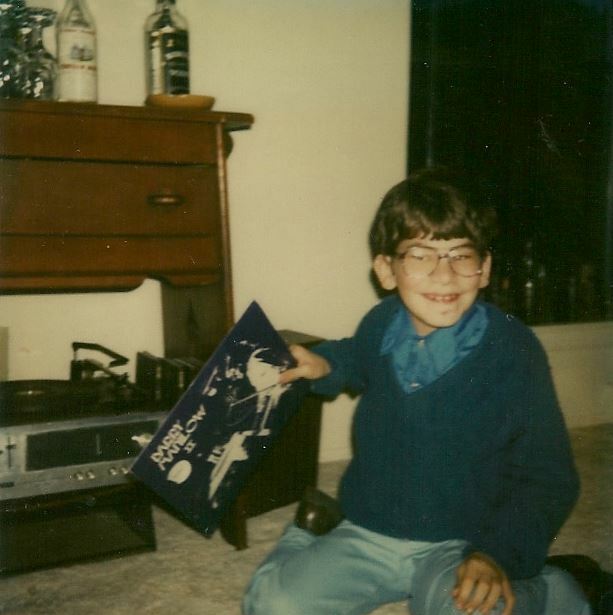 Ever since I was 4 years old, I have listened to Barry Manilow. 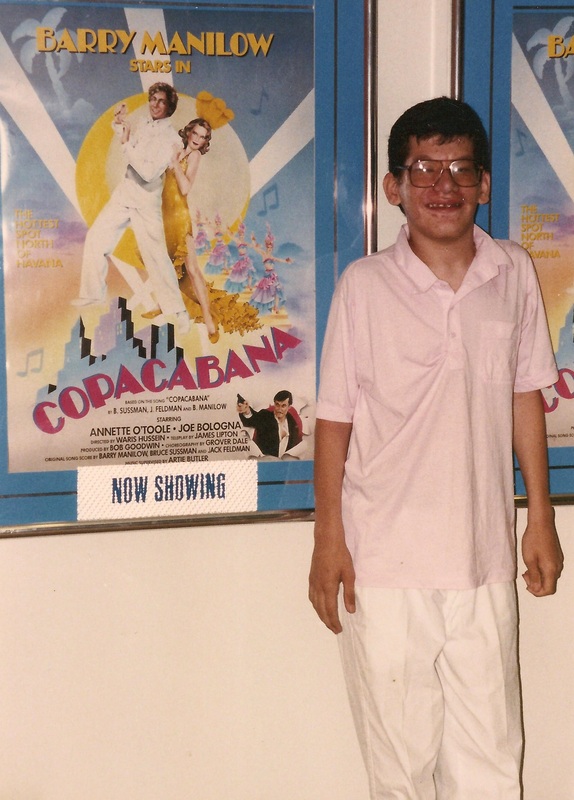 I used to have trouble speaking, and my family and the teachers at my special schools noticed that I like Manilow’s music. They and my family used the “Even Now” album to help me learn how to talk and communicate. It also helped my motor skills to drum along with the album. Since then, I have come a long way. I am one of Barry’s biggest fans. I have gone through over 18 different copies of “Even Now” and have seen Barry dozens of times. 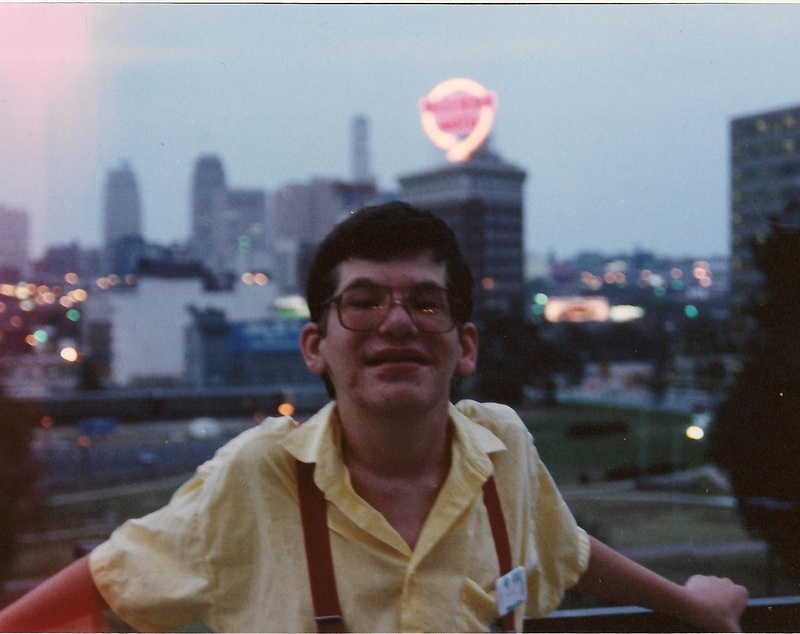 I am a member of the BMIFC, and traveled to Kansas City a few years ago for their convention. During the recent A & E “BARRY MANILOW: LIVE BY REQUEST” special, Wil Shriner read an e-mail that my brother, Adrian , sent for me. I requested Barry to sing “I Made It Through The Rain”, and I was thrilled when Barry dedicated it to me. I will never forget that night. MY BEST DAY EVER ! We had gotten our tickets for this years Manilow concert way back in May. I didn’t think that I could wait three months, but a couple of things came along that made me happy. I’ve got more about that day a little farther down the page. 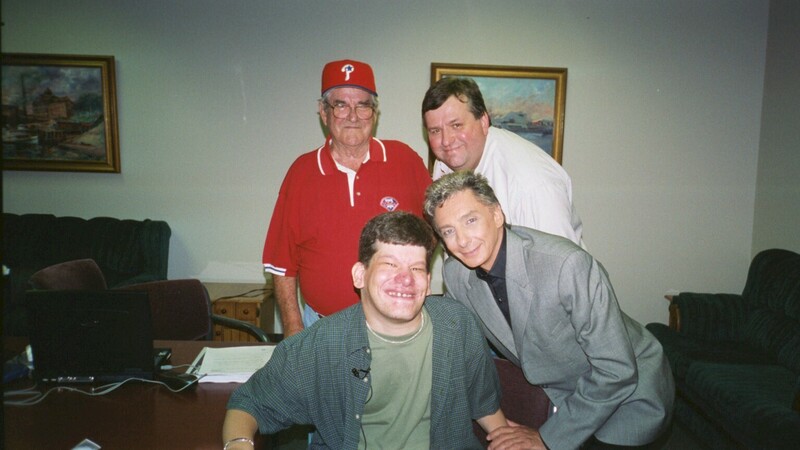 Because of that article, Margie Smith, a reporter for WB17, WPHL-TV here in Philadelphia, and Jill Wolfe, an assignment editor, contact me about doing an interview. I was nervous. The day of the concert, they came in a big van with the dish on top. Everyone in the neighborhood asked me what they were there for. They talked to me for an hour. I played my singing of I MADE IT THROUGH THE RAIN, and they had me sing my favorite song , COPACABANA, on camera. We talked about why I wanted to meet Barry. I think I did good. I got to show them my Barry collection, including my favorite album, EVEN NOW, but when they asked me to sing, I sang along with the COPA version from the Boxed Set. We talked about how Barry’s Music helped me. I answered all the questions without much help, though they also interviewed my sister, Julie, who teaches at the Easter Seal Society. While I was being interviewed, the phone rang. My brother, Adrian, said it was for me. When I got on the phone, it was Susan Dubow, Barry’s publicist. She said what I have always wanted to hear: I was going to meet my favorite singer, Barry Manilow. Channel 17 had set it up without me knowing. I love Channel 17! I was told that Mark Hewitt, one of Barry’s assistants, would come out to my seat around 7:45 [we were sitting in Section 101 Row E, which was about 13 rows from the stage] to take me backstage. He was right on time. He told me they would be back for me at 8:05. That was a long 20 minutes. Every minute seemed really long, and I was actually sitting on the edge of my chair waiting for them. Barry’s’ road manager [I forget his name, but he allowed me to hold his arm while I walked, since it was dark in the theater] led me and my father and brother back to the Green Room. Margie Smith and her cameraman were waiting for us. After about five minutes, Barry walked in, along with Mark. I was so nervous, I couldn’t stand up. Barry came over and talked to me. I showed him the Daily News article, and he said he had read it already. Barry said that he had been to my website, and Mark said that they had it in their Favorite Places folder on their computer. We talked about my favorite songs and he said he was singing them that night. I asked him about Annette O’Toole, who I used to have a crush on, and he seemed happy that I remembered his movie COPACABANA. I asked him if I could sing with him that night and he said that he didn’t know. We talked for well over five minutes and then he allowed us to take a couple of pictures. Mark took them so that my family could be in them. Finally, Barry had to go, but I thanked him again and he gave me a big hug. That was nice. Channel 17 asked me how I felt but all I could do was smile. Barry had made my life and now he had made my day. His road manager helped me back to my seat, which was nice because he must have had dozens of other things to do, and he chose to help me. Thanks. I was so excited when I got back to my seat. I liked the intermission music, which was a series of the original commercials that Barry wrote or sang for. Then Barry came on and the great night continued. He was wearing a white jacket, which made him easy to see. He sang all of my favorites including EVEN NOW. When he sang CAN’T SMILE WITHOUT YOU, I raised my hand, even though I knew I wouldn’t be picked. I sang along real loud, though. He also saluted a BARRY ABRAMS, who he said helped him reach number One in Philadelphia back in the 70’s when MANDY came out. All night long, it looked like rain but Barry said that he would try to stop it. He almost did. As he sang SOMEWHERE DOWN THE ROAD, the skies opened up and the screams of the people on the lawn threatened to drown him out. He begged those who felt they had to leave to come back again [He’s coming back!] next year, and started NEW YORK CITY RHYTHM. As the wind blew and the rain reached all the way up front and the people ran for cover, it felt like pandemonium. The rushing of the soaked crowd combined with Barry and his orchestra trying to compete with the noise made for a wild, wonderful version. The orchestra really added to the show. It made the songs sound like my records, especially the Sinatra stuff. I never really listened to Frank before the MANILOW SINGS SINATRA CD, but since then I listen to my brothers Sinatra CD’s when we are in the car. This was great, as was WHEN OCTOBER GOES. All the orchestral numbers were great, especially WEEKEND IN NEW ENGLAND. It was also fun when Barry isolated the individual instruments in the orchestra. My favorite part of the show was Barry playing the recording of his grandfather urging him to sing “Happy Birthday” when he was three years old. 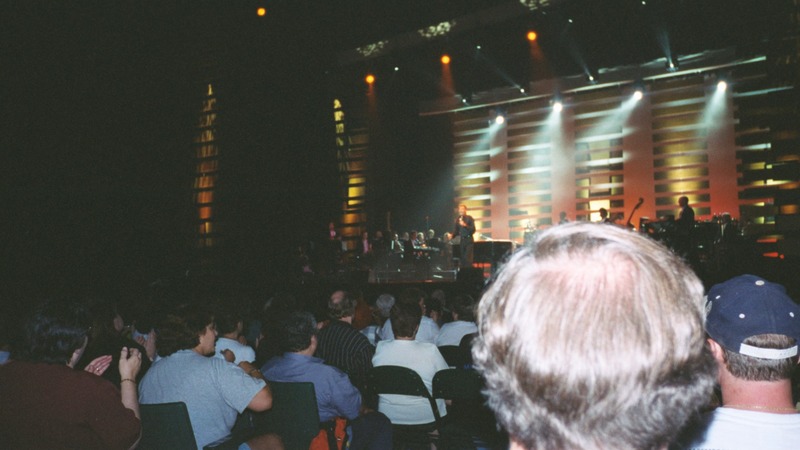 When I was backstage with him, I told him that I liked that recording of his grandfather, especially on the FIRST BARRY MANILOW SPECIAL, and was really glad to here Barry use it during THIS ONE’S FOR YOU. It reminded me of my mom. He ended the show with my favorite. COPACABANA , and second favorite I MADE IT THROUGH THE RAIN. During COPA, the sound system got real loud and then went out for a minute. While I didn’t like it, we were close enough to the stage to still hear the band playing as Barry got the crowd to sing for him. It was great. This may be the best Barry show I’ve seen in a long time. I only wish he was coming back before next year, but I’ll try to go see him wherever and whenever I am able. The Second Best Day Ever! 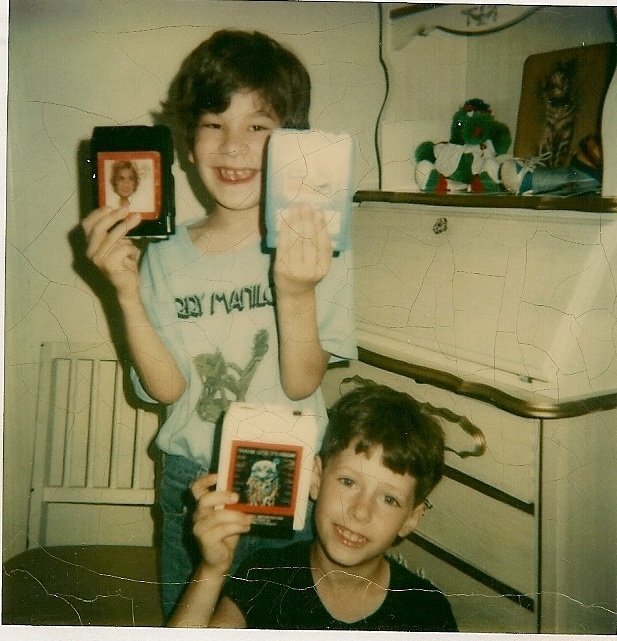 The second most exciting thing was that the Philadelphia Daily News did a big article on my love of Manilow’s music and how it has been so important in my life. They even ran a great color picture of me. This ran in the Aug 11, 1999 issue. Click here if you would like to read the text of the article. If you saw it, please e-mail me with your comments. Thanks to Al Hunter, Jr. of the Daily News for liking my story. 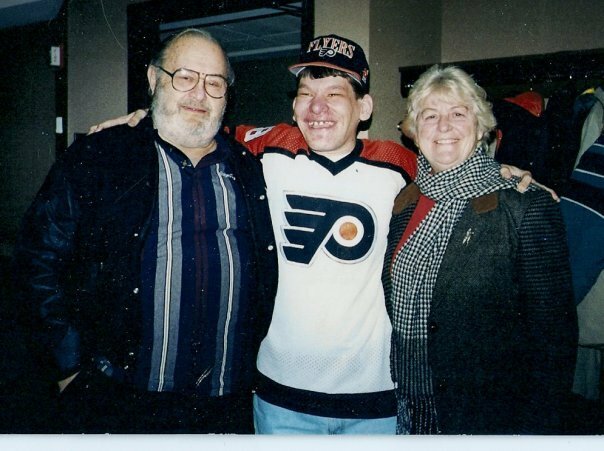 One of the reasons that I listened to Flyers Hockey, Gene Hart, passed away recently. I was glad to see that so many other people loved him as much as I do. I went to a memorial service at the First Union Center, where we , as Steve Coates said, celebrated the life of my friend. I got to see his wife, Sara, and his children again. Lauren , a great singer and his daughter, even gave me her autograph because I asked, just like I used to ask Gene every time I saw him. He gave it to me, even though I had gotten one a hundred times before. Gene Hart was a legend in Philadelphia. 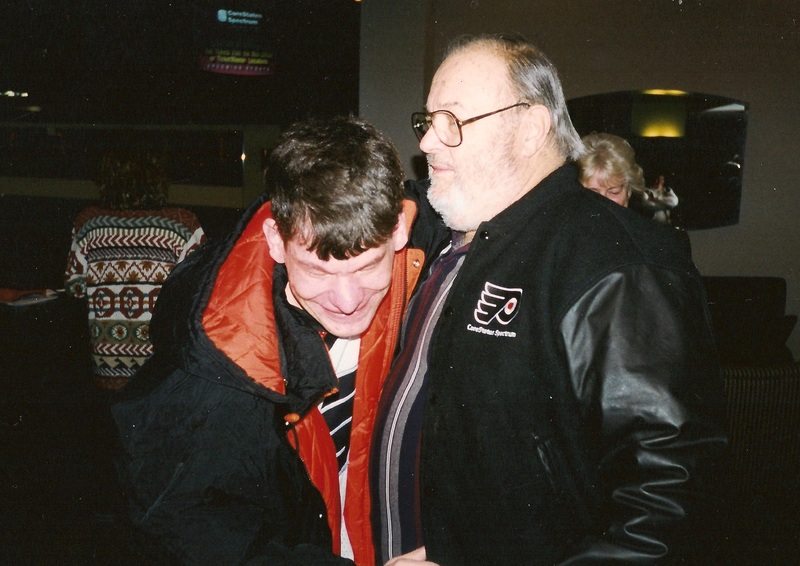 He was THE VOICE OF THE PHILADELPHIA FLYERS hockey from 1967 until 1995. He was a great announcer, and when he shouts “HE SHOOTS, HE SCORES”, the entire city would feel good. His tapes and voice helped me learn to watch what was going on and express my feelings about what I am seeing. He was a diver on the old STEEL PIER IN ATLANTIC CITY, and his wife, SARA, rode the HIGH DIVING HORSE. He took me to dinner when we saw him vacationing in Honolulu. 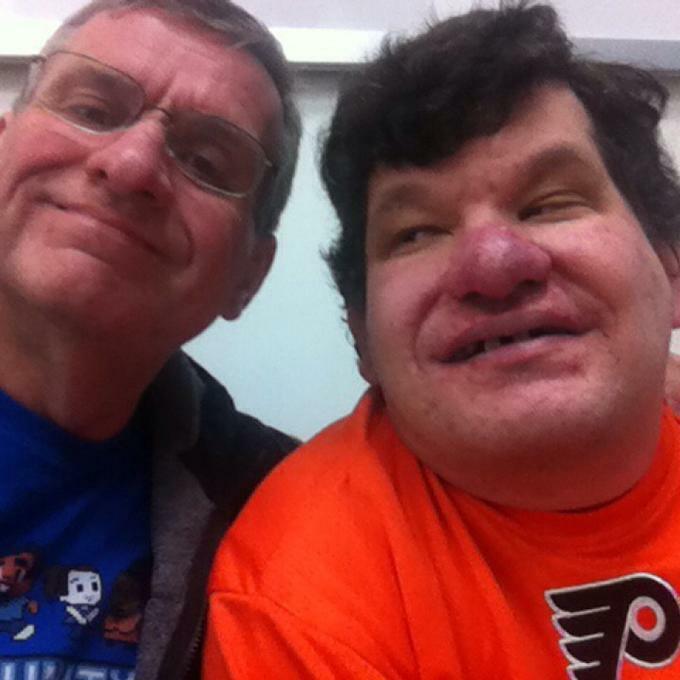 He told us funny stories about the Flyers , especially Dave Brown. He always had time to talk to me.